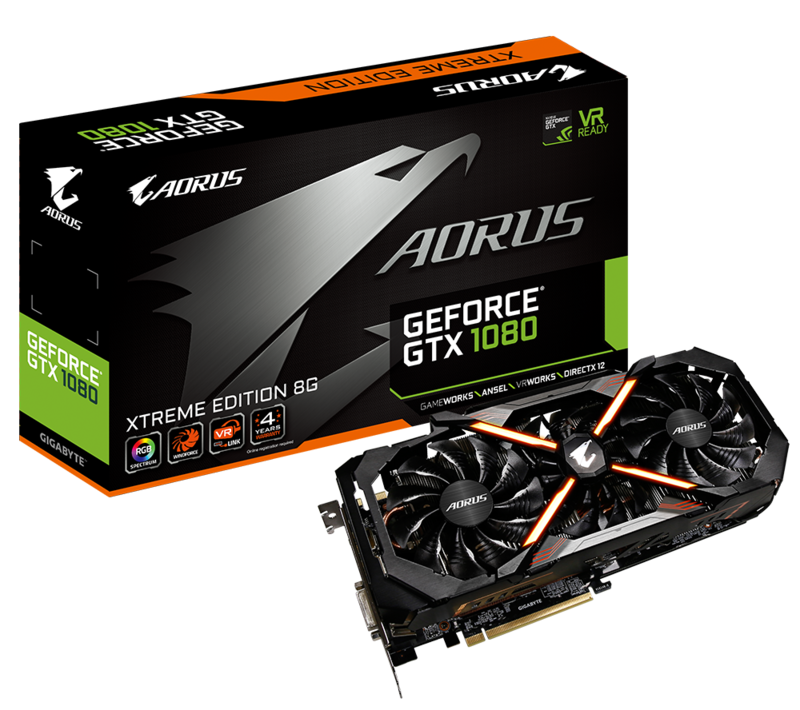 GIGABYTE, the world's leading premium gaming hardware manufacturer, is proud to announce its brand new premium AORUS line of gaming graphics card with AORUS GeForce® GTX 1080 Xtreme Edition. Right after the launch of AORUS motherboards, GIGABYTE quickly extends its gaming frontier with this new graphics card that combines the prowess of Pascal architecture with AORUS total solution in heat dissipation. 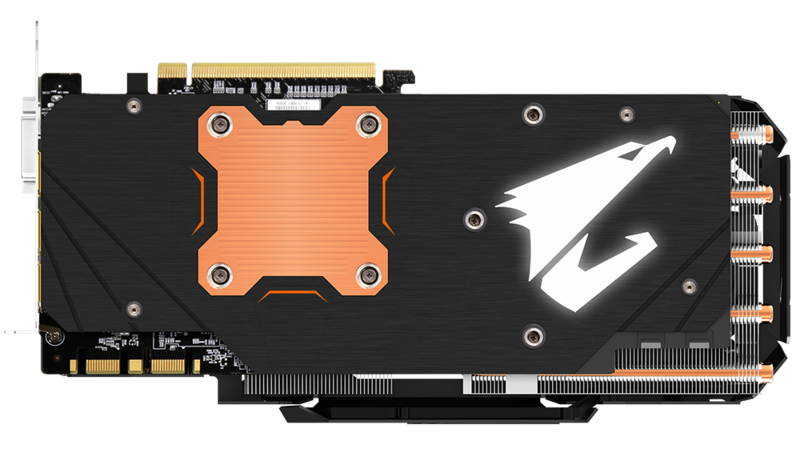 Also packed with gamer-favorite RGB customization and other premium winning features, the VR-ready AORUS GTX 1080 Xtreme Edition is a powerful graphics card that pushes gaming experience yet to another new height for gaming enthusiasts. The new AORUS graphics card is equipped with the legendary WINDFORCE Stack Cooling module and takes a leap further. In addition to the GPU, the VRAM and MOSFET are properly cooled to boost performance sky-high under stable operation. Up front, the large copper base plate efficiently transfers heat from the GPU and VRAM to the heat sink. Excessive heat can be dissipated through the back side as well with an extra copper plate, providing a well-rounded thermal solution for the GPU. The rest of WINDFORCE Stack Cooling module makes no compromise with the three 100mm stack fans and 6 composite copper heat pipes for a stunning cooling performance. The use of double ball bearing fans ensures the card will go the distance. The silent semi-passive fan profile allows gamers to enjoy gameplay in absolute silence when the system is running light or idle. An LED Fan Stop indicator provides a user-friendly, instant display of the fan status. The AORUS GTX 1080 Xtreme Edition well prepares gamers for virtual reality with the AORUS VR Link. This exclusive feature comes with 2 more HDMI connectors at the front of the card, offering extra output flexibility for enthusiasts to connect VR devices while using HDMI displays at the same time without the hassle of swapping cables or using any additional adaptors. The GTX 1080 XTREME GAMING incorporates numerous unique gaming features that make the card an ideal fit for the enthusiasts. The RGB lights on both the shroud and the backplate spark the fierce look of AORUS from every angle. Gamers are free to customize with virtually unlimited color options and light effects to make each gaming rig unique and personal. 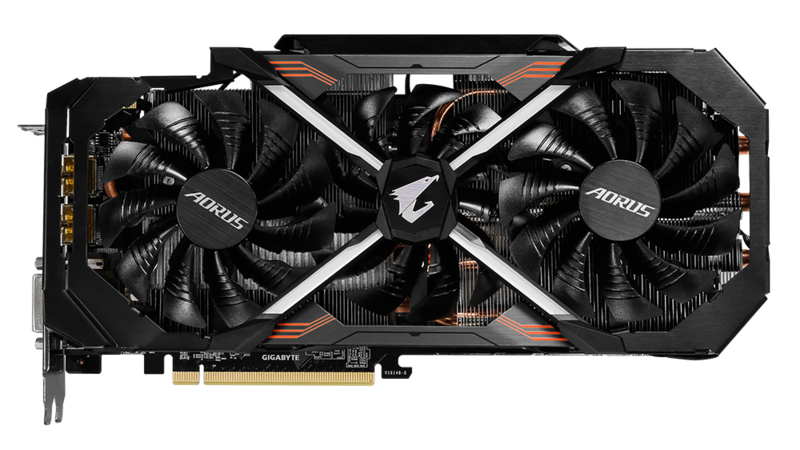 Forged with sorted top-notch GPUs, the new AORUS graphics card guarantees supreme overclocking capability without compromising system reliability. The use of premium-grade chokes and capacitors also ensures superior durability for a longer system lifespan. The aerospace-grade PCB coating protects the card against moisture, dust, and corrosive contaminants. The metal back plate further strengthens the structure while giving the card a sleek, gaming outlook. The graphics card is gamer/builder friendly as the PCB is manufactured through fully automated production processes to keep the surface of the circuit board smooth and free of sharp-edges. Any power abnormalities can be easily detected with the smart power LED indicator. AORUS Graphics Engine is a redesigned utility that provides gamers with a total control of their AORUS gaming graphics card. Via its intuitive interface, clock speeds, voltage, fan profiles, power target, and LED illuminations could be easily managed and customized. AORUS X9 DT, with Intel Core i9-8950HK and NVIDIA GeForce GTX 1080, has the fastest components available and accelerates. The 2018 version of the Aorus X5 v8 is able to stand up to its rivals in most areas. The Aorus X9 is a powerful, solidly built, and slim prime gaming notebook. The Aorus X3 Plus R7 is a premium quality choice. NUR ICH HABE ES! Das neue Aorus X5!